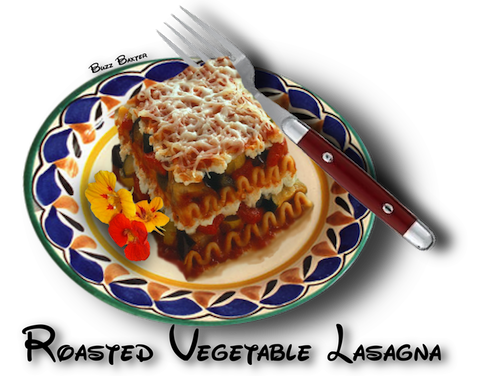 FIRE OR OVEN ROASTED VEGETABLE LASAGNA. There is something about roasting vegetables that brings out the succulence and flavor that no other way of cooking can achieve. • 1 can or 2 cups diced tomatoes or  Roast  and then dice. • 1  tomato sauce, 8 oz. ●  Dip the zucchini, the eggplant and the onion rounds  in the olive oil and salt and pepper. Grill slices on a barbeque until soft. Grill the onions until they are golden on both sides. Set aside and let cool. ●  Peel peppers and squeeze out garlic and set aside. 1. Layer of lasagna noodles,  layer of zucchini & onions,  layer of Mozzarella and goat cheese,  layer of sauce mixture. 2. Layer of noodles,  layer of eggplant & onions,   layer of Mozzarella and goat cheese, layer of sauce mixture. of the sauce mixture,  and a  layer of noodles. 4. Lightly salt and pepper each layer. 6. In the tomato sauce and the diced tomatoes,  combine the basil,  salt, pepper and roasted garlic. Divide and pour this over the layers. 7. Sprinkle the top with bread crumbs and Parmesan cheese. 1. Bake, covered with foil, in a 375℉ oven for 30 minutes. Remove the foil and bake another 15-20 minutes to brown the top. 2. Serve hot as a main dish or a side dish. 1. There are many vegetables that can be roasted and would serve well in this dish. Experiment with your favorites.